KERRY’S PLACE AUTISM SERVICES HAS BEEN COMMITTED TO ENHANCING THE QUALITY OF LIFE OF PERSONS WITH AUTISM SPECTRUM DISORDER (ASD) SINCE 1974. We are leaders in developing and providing evidence-based supports; and by building capacity by sharing our knowledge. As Canada’s largest service provider for children, youth and adults with ASD, we serve more than 8,000 people with ASD and their families each year. With the number of individuals with ASD diagnosis growing at an alarming rate each year, the need for more supports and services continues to rise. Through collaborative efforts and a dedicated staff we provide assistance to enable communities to increase their capacity which has resulted in the growth of services available to people with ASD and their families. 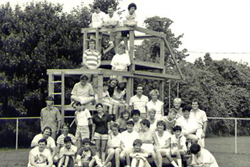 During our humble beginnings in 1974, the farming community surrounding Clarksburg, Ontario, in partnership with the Ministry of Health, rallied in support of the O’Neil family when they courageously opened their door to a handful of teenagers living within the spectrum of Autism. Their vision was to effect change in the way these individuals were supported. Through unwavering loyalty and tenacious determination Val and Ann O’Neil and the other founding families established a powerful movement that became the catalyst for change in how we understand and support individuals with Autism Spectrum Disorder. 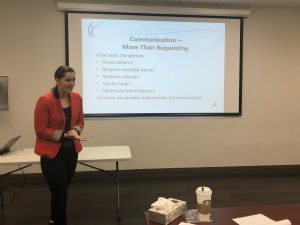 They formed the Ontario Society for Autistic Children out of concern that the needs of persons with autism approaching adolescence and adulthood were not being met in the educational or residential systems for the mentally handicapped. Kerry’s Place was incorporated in 1984 as a non-profit, non-share Ontario corporation. The program and corporate name were chosen in honour of the O’Neil’s daughter Kerry, who was one of the original residents. Nearly three decades after the opening of the Clarksburg centre, Kerry’s Place has grown to serve the regions of Peel/Halton, Dufferin, Durham, York/Simcoe, Toronto and Hastings. WITH THE NUMBER OF INDIVIDUALS WITH ASD DIAGNOSIS GROWING AT AN ALARMING RATE EACH YEAR, THE NEED FOR MORE SUPPORTS AND SERVICES CONTINUES TO RISE. The affairs of Kerry’s Place are governed by a voluntary board of directors representing various fields of expertise. They view community involvement as an integral part of its philosophy and strategic planning. The board of directors is made up of a diverse group of individuals who bring with them the experience and knowledge in areas such as finance, journalism, education, business, law and human resources. Recently, we witnessed a monumental achievement in the fulfillment of the Government’s promise to end institutionalization for individuals living with developmental disabilities. The official closing of Huronia, Rideau and South Western Regional Centres paved the way for Kerry’s Place and its community partners to engage the public in gaining a better understanding of these individuals and their right to live, participate and prosper as valued members of society. The struggle is not over, however, as we must continue to help people in communities throughout Ontario and elsewhere to overcome stereotypes and misunderstandings to understand the need for, and to create appropriate environments and supports in which individuals with Autism Spectrum Disorder can thrive.